Harrogate Town fought back from a goal down to see off Braintree Town 3-1 in their first National League fixture for three weeks. After so long without a game, Simon Weaver’s men weren’t at their fluent best, however they still had enough in the locker to claim all three points as Jack Muldoon, George Thomson and the returning Michael Woods all finished clinically. The Iron then snatched the lead, out of nothing, with 26 minutes on the clock. Justin Amaluzor got the better of Liam Kitching all too easily, gliding past the Harrogate left-back and into the box before cutting inside and sending a strike across Belshaw and inside the far post. Town rallied and from what was by far their best move of the first period, Weaver’s men got themselves back on terms, just a minute before the interval. Beck chested a ball down into the path of Josh Falkingham and the Harrogate skipper played Muldoon clean through on goal with a nicely-weighted first-time pass. Town’s top-scorer raced away, confidently slotting past the advancing Legg to register his eighth of the season. The game was then turned on its head in the 64th minute, the otherwise quiet Thomson producing an excellent finish from the edge of the penalty area. Letting a bouncing ball run across his body and onto his left foot, he drilled an unstoppable low strike past Legg and into the bottom corner. The Iron had a go in the closing stages, and there were a couple of nervy moments inside the home box before substitute Woods rounded things off three minutes into stoppage-time. He initially nudged the ball towards Beck, who, with his back to goal, flicked a pass first-time back into the path of Woods who finished with ease. Elsewhere in the National League, FC Halifax Town suffered a miserable away day to forget as they lost 4-0 at Ebbsfleet United. A last-minute goal from Christopher Howarth kept Tadcaster Albion in the top three of the Evo-Stik League East Division after a 1-0 victory at Spalding United. Fourth-placed Brighouse Town kept pace with Albion thanks to a morale-boosting 4-1 win over Lincoln United. After falling behind to a Matthew Wilson goal, Adam Jones, Mohammed Ibrahim, Adam Field and Thomas Robinson all got on the scoresheet for Town. Just a point behind Tadcaster and Brighouse are Pontefract Collieries following their 4-2 victory over Carlton Town. Michael Dunn, Eli Hey and Vaughan Redford netted early on for Pontefract and Hey’s second goal on 61 minutes sealed the three points. Probably the game of the day was the Yorkshire derby between Ossett United and Frickley Athletic – where Andy Monkhouse scored his first goal for United in the sixth-minute of added on time to wrap up a 4-3 victory. Tom Greaves and Adam Priestley gave United an early 2-0 lead but that was cancelled out by goals from Samuel Cable and Jacob Hazel. Thomas Corner made it 3-2 for Ossett just past the hour mark before Danny Rowe curled in a free-kick to make it 3-3 in the last minute. However, Monkhouse was to have the last laugh. Yorkshire Amateur moved nine points clear at the top of the Northern Counties East League Premier Division following their 3-0 victory at Athersley Recreation. A brace from Brice Tiani and a goal from Ashley Flynn did the damage for Amateur as their nearest rivals Penistone Church slipped to a 1-0 defeat at home to Worksop Town. 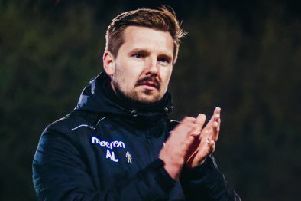 Elsewhere in the Premier Division, Nash Connolly’s goal earned fourth-placed Hemsworth MW a 1-1 deaw at Eccleshill United, while fifth-placed Knaresborough Town lost 1-0 at Handsworth Parramore. Goals from Aaron Fell and Tom Jackson saw Liversedge defeat Harroagte Railway 2-1 while Garforth Town lost 2-1 at Barton Town. In Division One, Selby Town defeated FC Bolsover 3-1, Nostell MW drew 2-2 at Shirebrook Town, Glasshoughton Welfare lost 2-0 to Parkgate while AFC Emley were beaten 1-0 at Dronfield.